If you follow me on social media, you’ve definitely seen our garage gym since most of my videos are shot there. But it didn’t always look like the photos above. In fact, it evolved over many years from this milk crate in our master bathroom. 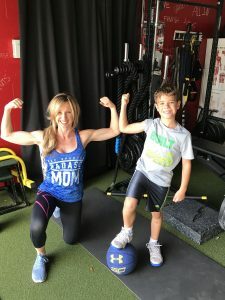 It was only after my training expanded, adding a pull-up bar and TRX, and then a barbell out on the lanai, that it seemed like we needed to establish a more dedicated space. At first, we only laid turf on one side of the garage and added a rack for our weights. 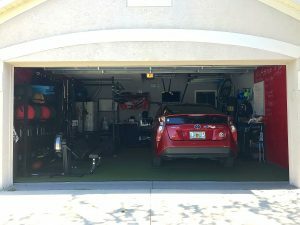 Less than a year later, we upgraded to more equipment with better turf, covering the entire garage. 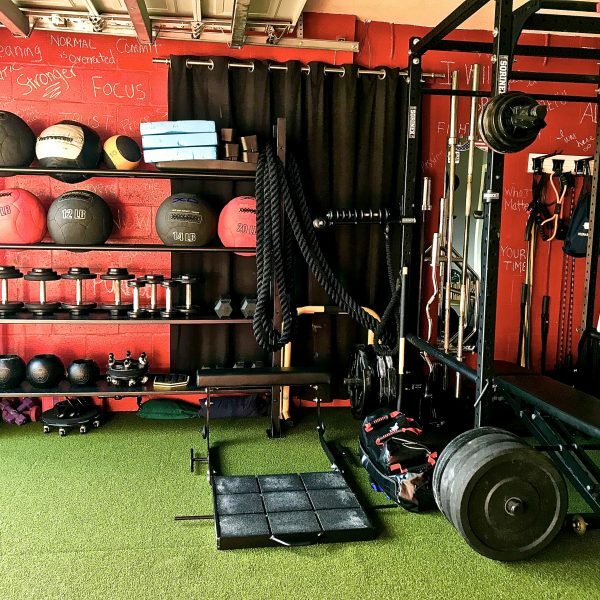 For more on the evolution of our garage gym, check out this CNN article about it from a couple years back. 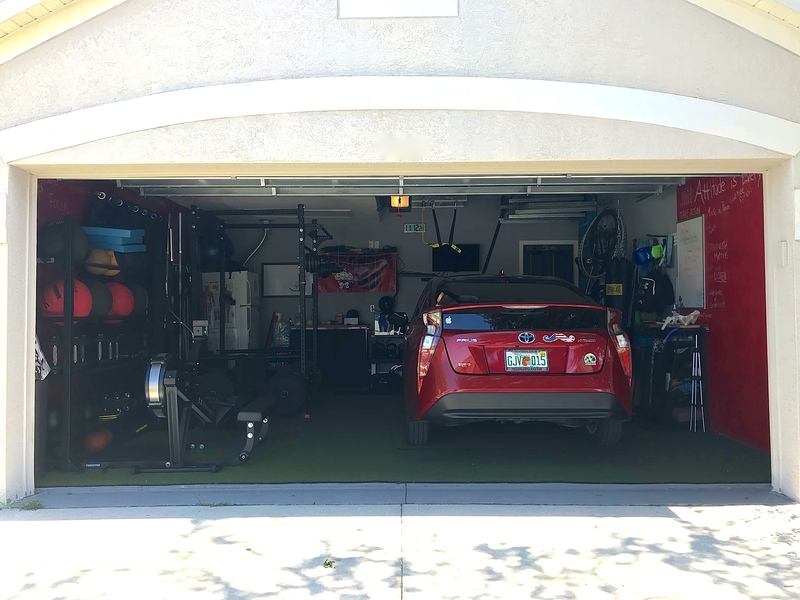 Because we wanted our garage gym to enhance our lifestyle, not disrupt it, we were thoughtful about how we relocated the items previously kept in the garage—like my car! Thankfully, because my Prius is so light, we realized that, using a couple extra pieces of the upgraded turf under the tires, I could still park my car inside without leaving dents in the main turf. For all the other items previously taking up residence in the garage, we purchased a backyard storage shed, wall bike rack, garage ceiling storage mount, and rented a small storage unit for seldom-used items, like holiday decorations. And, as we added more equipment to our gym, like the Concept 2 Rower and TRX rings, we had to be clever about accessibility and space. For instance, we recently installed a track system for the heavy bag for easier access and the ability to store it out of the way, against the wall, when not in use. 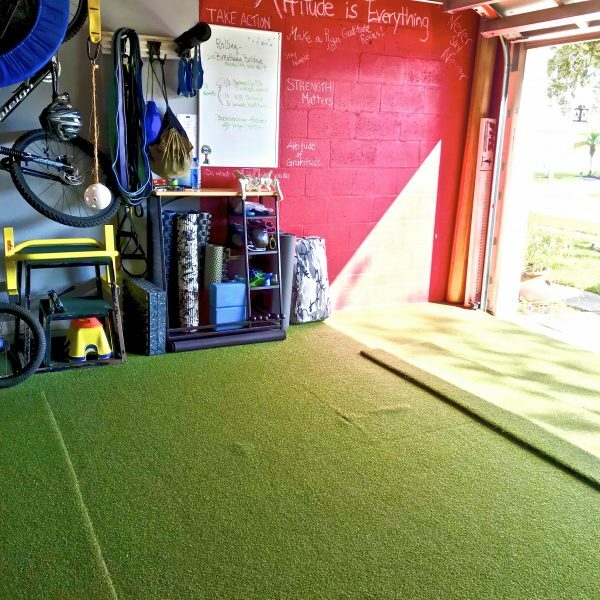 We consider our garage gym our favorite “family room” in the house. If our son isn’t joining us in the garage, he’s often just outside riding his bike or playing in the driveway with friends. Consequently, training is never seen as something that keeps us from time together—just the opposite—especially as a couple. My husband and I always look forward to training together at home. If you missed it on Instagram, here’s a fun-but-definitely-cheesy video I posted previously of highlights from one of our daily garage gym training sessions. Ease of access (no travel time—no excuses). 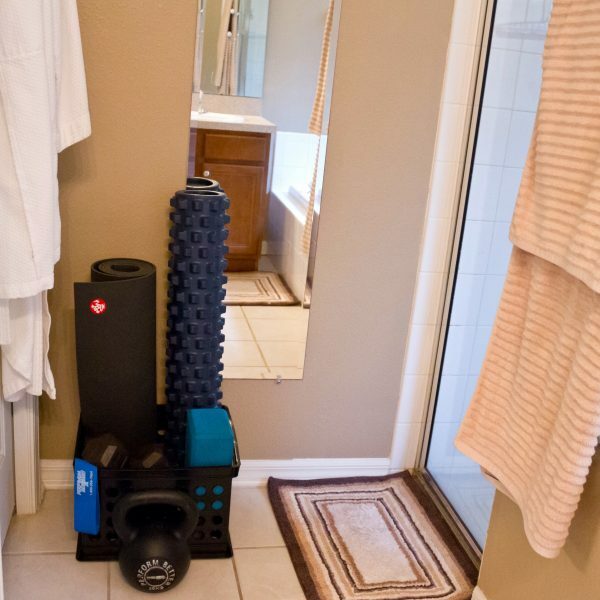 The gym is part of your home, so training in it also becomes part of your lifestyle. The time you spend in your home gym is quality time that sets a positive example for your family, friends and neighbors. 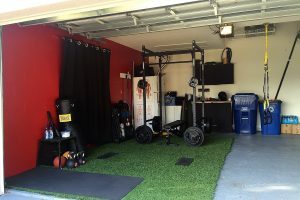 Want to create your own garage gym or other dedicated home training space? Let your training space evolve with your needs. 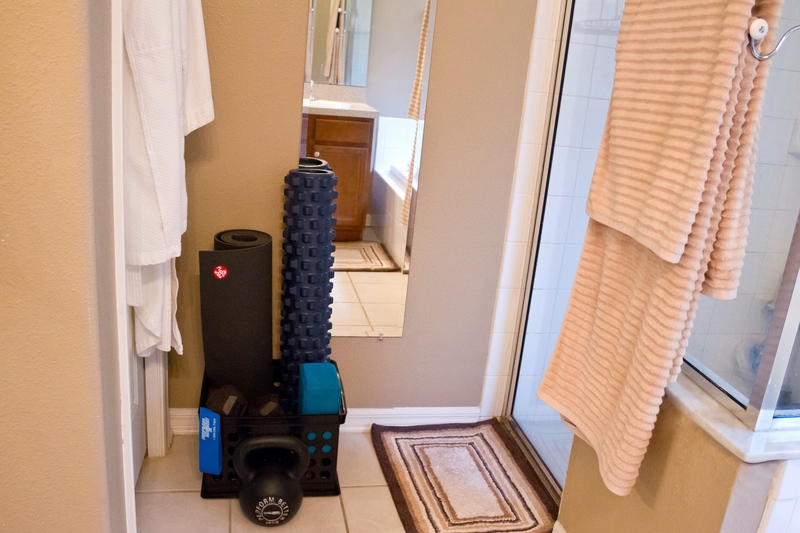 Ensure your gym space enhances your lifestyle—doesn’t disrupt it. Keep space needs and accessibility in mind when adding equipment. I’d love to help you create an awesome space like ours! 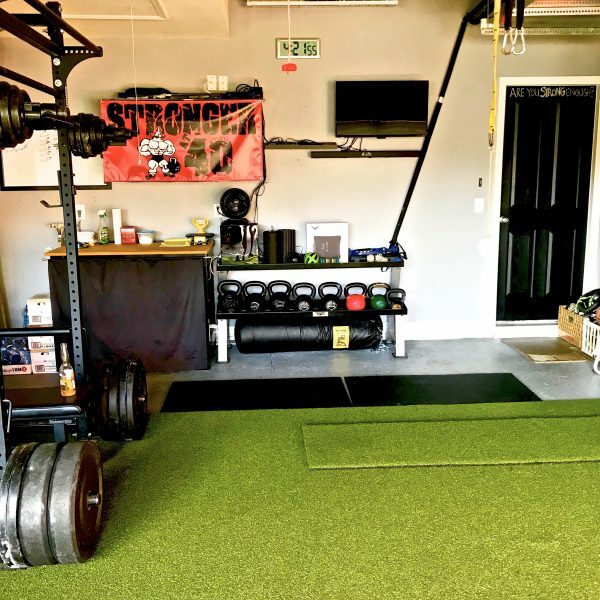 I loved how your garage gym evolved! I have ambitions to create the same space out of a storage room in my basement. The winters in Chicago are too long and do not make it practical to keep cars out of the garage nor would it even be warm enough even with a space heater. Did you have someone help design the space with the dimensions you had to work with? Is there a minimum ceiling height recommendation? I’m short so I bet I could do overhead work anywhere, not sure about my college age son’s or even taller hubby! 😉 btw, great job on the new website, blog and youtube updates! You are an awesome mentor in so many ways! I love the many new ways you have expanded how you share information!!! Hey Julie. Thanks for all your kind words! The design of our gym has evolved and continues to evolve as we add things. We’ve turned the rack a couple times and moved and added shelving as we added other equipment. The ceilings in 3/4 of the garage are about nine feet (which made fitting our squat rack in a little tight) but then the back right section of the garage is at least 18 ft. That higher 1/4 section is partially obstructed by hanging AC and hanging storage shelf but those things still allow for at least 14 ft of height (enough for someone tall to do plyo). Thanks for sharing, Dana! How do you keep the turf clean with the car on it? I’d like to put more flooring down on my garage gym but concerned about it getting gross from whatever drips off my car. Thoughts? We have two extra pieces of turf that we move in and out for me to park my tires on when the car is in the garage. But we put those down more to keep the weight of my car from making dents in the turf. Because we live in Florida where we don’t have to deal with snow and slush and I don’t drive on unpaved roads, my tires and wheel wells are never really dirty, and since it’s a hybrid, there really isn’t anything ever leaking from it. If you are concerned, you could always lay a tarp down. Also, we vacuum the turf regularly and occasionally hose it down and use the shop vac. Thanks! It’s a dream project that your story is motivating me to complete! !